Nominations now open for the best teaching method to the Global Competition on Best Practices in Forest Education. Don’t miss the 18 January 2019 deadline! More often than not, great educators do not receive the recognition they deserve and their powerful teaching methods have a limited sphere of influence. 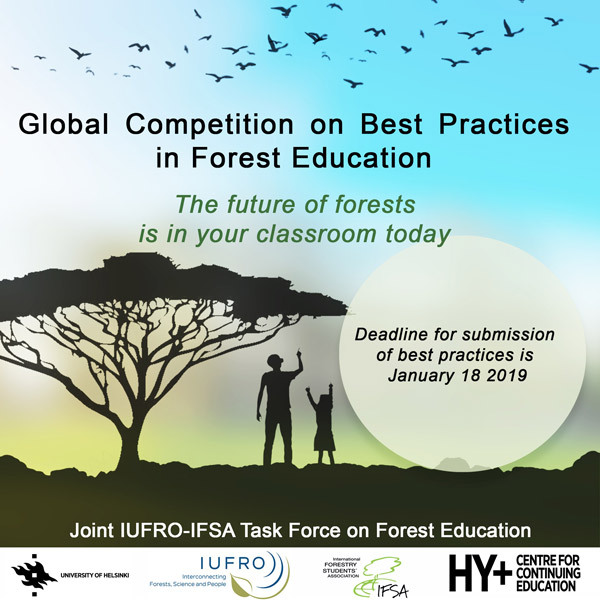 To raise awareness of forest education and its impact on sustainable forest management, IUFRO, IFSA, HY+ and the University of Helsinki in collaboration with FAO have launched a Global Competition to find the Best Practices in Forest Education. Winning methods will be shared to a worldwide audience, and winners will of course receive prizes! The Best Practices Competition will award two main prizes: One IUFRO 2019 World Congress Prize Package and one Forest Visit to Finland!